The DeMarker indicator compares the most recent price action to the previous period’s price in an attempt to measure the demand of the underlying asset. Generally used to identify price exhaustion and market tops/ bottoms. The DeMarker indicator is a momentum oscillator, similar to the RSI and many others available today. The DeMarker scale is between 0 and 100, typically measuring overbought above 70 and oversold below 30. 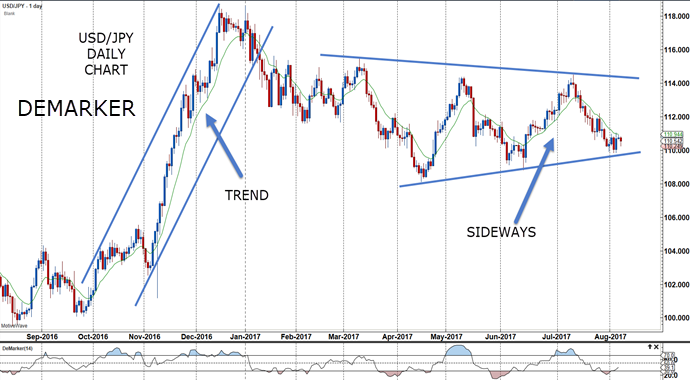 In this article, we will explain how to use this indicator during trends and sideways markets. DeMarker measures the demand for the market by comparing recent price action to previously closed price to gauge the underlying trend strength. As with the RSI, it is less prone to distortions, and presents as a fairly smoothed curve below price. Using shorter time spans than 14 periods will create greater volatility and establish more overbought and oversold conditions. Longer time periods will produce fewer signals. TRENDS: The first step is to look for signs that a market is trending or about to trend. This can be done by looking at the fundamentals and focusing on markets that are starting to move. Create a watch list. After deciding that a stock sector, currency grouping or commodity is about to trend, then use the DeMarker indicator to join the trend. In the USD/JPY Daily Chart above, look at the trend on the left. Look to go long when the DeMarker indicator dips below 40 (one can use 30 as well). In the example above, the indicator dips below 40 and back above right at the start of the trend, and never dips below 40 again on this time frame. Moving to the 4-hour chart as seen below, there are other opportunities to join the trend with the DeMarker dipping below 40 and turning back up again. Use the indicator in conjunction with trend lines and channels and as long as price remains in the upward sloping channel, look for buys on dips. 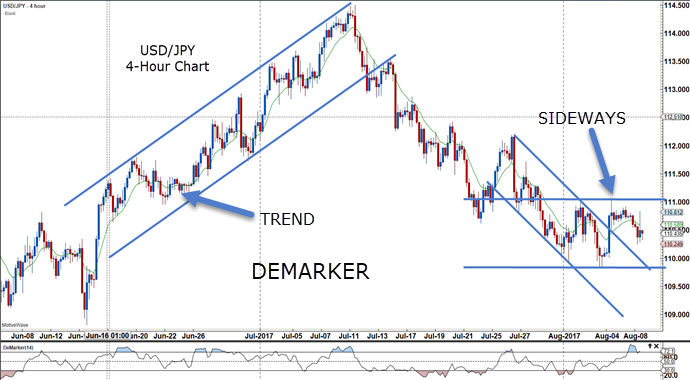 SIDEWAYS MARKETS: When a market is rangebound, as in the USD/JPY Daily Chart after the initial trend move, the DeMarker oscillator is a good tool to use to signal buy and sell signals when the market is overbought and oversold. Look for oscillator divergences at market tops and bottoms during sideways markets to trigger a change in trend. 123 reversals on a smaller time frame are also good confirmations with this reversal signal during sideways markets. These signals work on all time frames, but I like to do a top down approach and use the larger time frame for the context, and the smaller time frame for trade entry. In this example, the Daily would provide the context for the trend move and the 4-hour would provide the entries using the DeMarker indicator. Learn how the DeMarker indicator helps put traders in the trend as it is progressing, as a breakout strategy. Start incorporating the DeMarker indicator into your chart set-up. Finally, use the DeMarker indicator in developing trading strategies with other indicators. This entry was posted in Trading Tips and tagged day trading, demarker, forex, forex trading online, forex trading system, indicators, successful trader, trading, trading plan, trading strategy, trading system.